At last some progress, Found that I tried to be too ambitious in March hence delay to finishing all that stuff. The only bits to complete on these now are a few need the snow effect added to their bases and the US Paras need flock, but these will wait on some more figures that I'm varnishing at the moment with similar stuff to add. 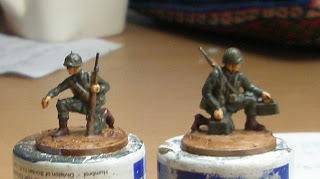 After these there will be a bit of a flood of stuff getting completed as I've got a large number of my WWII project just needing retouches, varnishing and basing to be ready. Then onto building some vehicles and support weapons for these and putting the finishing touches to a number of 25mm metal figures for a variety of games. Revell German WWII automatic and special weapons.